Triceratops, the three-horned herbivore, can be found roaming the grasslands of ARK: Survival Evolved. This not so gentle giant flourished in the late Cretaceous period, 65 million years ago. With its large bony frill and three enormous horns, Triceratops was (and is) not a dinosaur to be trifled with. Will you be triumphant or trampled? Triceratops, or Trikes, are normally very docile animals and can be found grazing in fields or wandering the shoreline. They are one of more common creatures on the island but far from the weakest. These tough Trikes become extremely aggressive once angered and will charge anyone who may pose a threat. When provoked they will barrel towards the enemy and buck their head defensively. Trikes are able to knock back an attacker with their headbutt, making them very dangerous near cliffs and steep hills. The knock-back is significantly influenced by the enemy’s weight and can be dodged if skilled enough. Try not to aggravate this species when starting out, their short temperament will get the best of you. 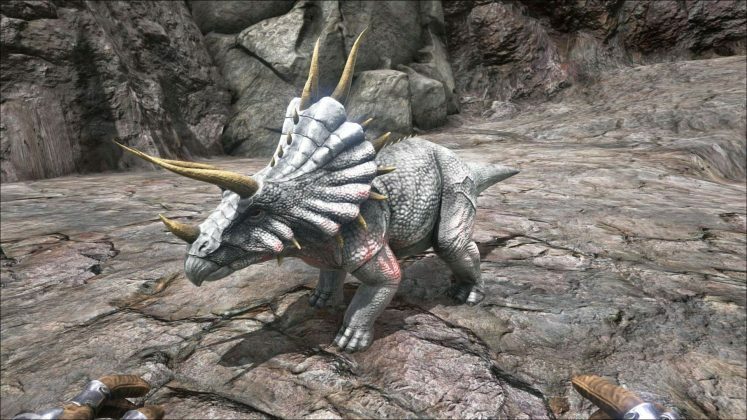 Trikes in ARK seem to be a cross between Triceratops and Styracosaurus; taking the prominent three horns from Triceratops and the flashy spiky ridged frill of Styracosaurus. This jousting machine comes in a range of natural colour schemes and patterns depending on the region it’s found in on the island. Don’t go petting the pretty Triceratops just because its your favourite colour. White as can be. Albino three-horn. 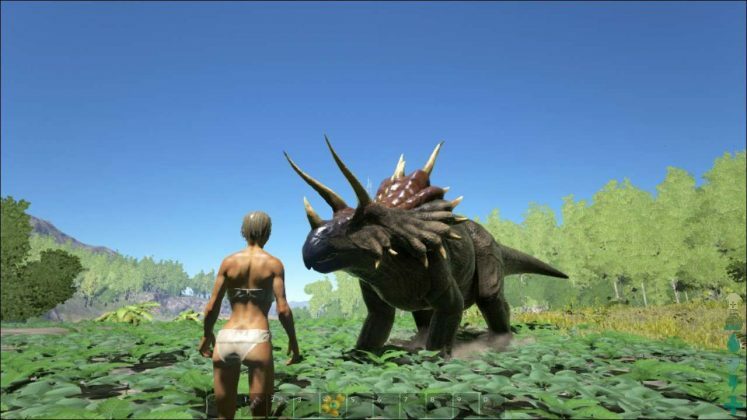 Once you’re a few hours into your play-through, you’ll want to start taming some dinosaurs. 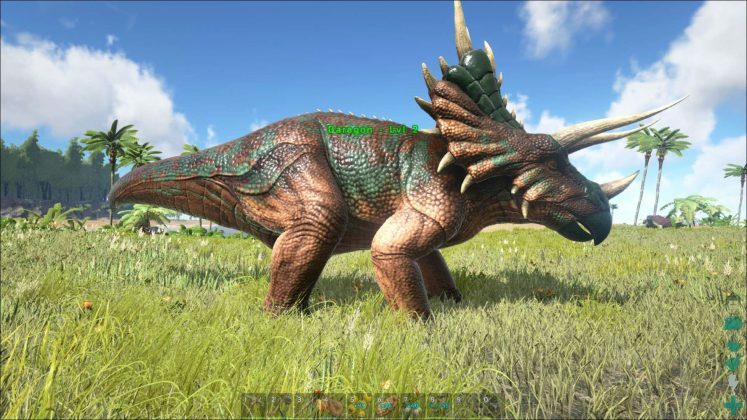 Triceratops is actually a great beginner dino because of how easy it is to tame. Trike can be easily knocked out and has a relatively low amount of torpor. 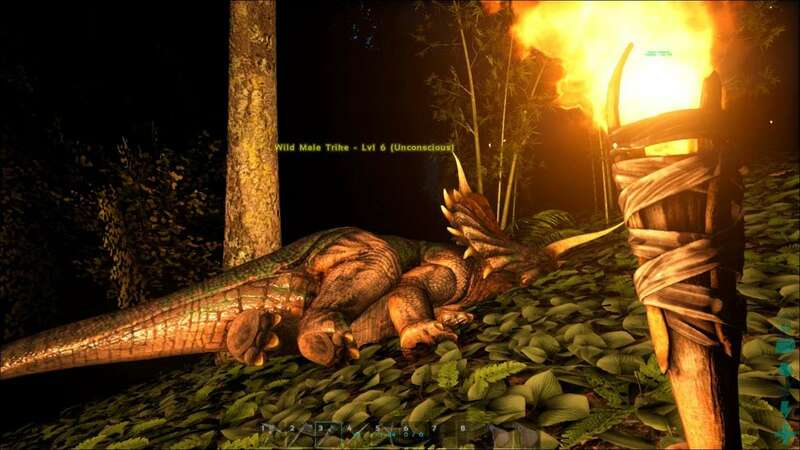 Like any creature in ARK, taming requires you the knock the animal unconscious first with a Slingshot or Tranq Arrows. Trikes are rather slow and can be kited easily. Try to run circles around it while going for headshots with your Tranq Arrows. Attempt to lure the Trike away from open areas and into an enclosed space. 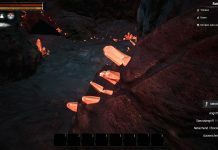 Here you can try to get the animal caught between trees and rocks for an easy knock out. 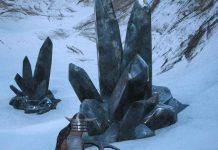 It will take about 10 Tranq Arrows to bring down a Trike, depending on its level. When the four-legged freight train is down for the count, make sure to feed it either crops, berries or Carnotaurus Kibble for best results. Place the food in the creature’s inventory and it will eat it slowly overtime till tamed. You can maintain the Trike’s unconsciousness with Narcotics or NarcoBerries. Being one of the easier dinosaurs in the game, Triceratops takes about 45 minutes to an hour to tame. Make sure to keep any predators or griefing players away while the taming process takes place. How About a Test Drive? Triceratops are one of the most common early-game mounts in ARK: Survival Evolved. If you’re looking for an easy steed, Trike is your best bet. 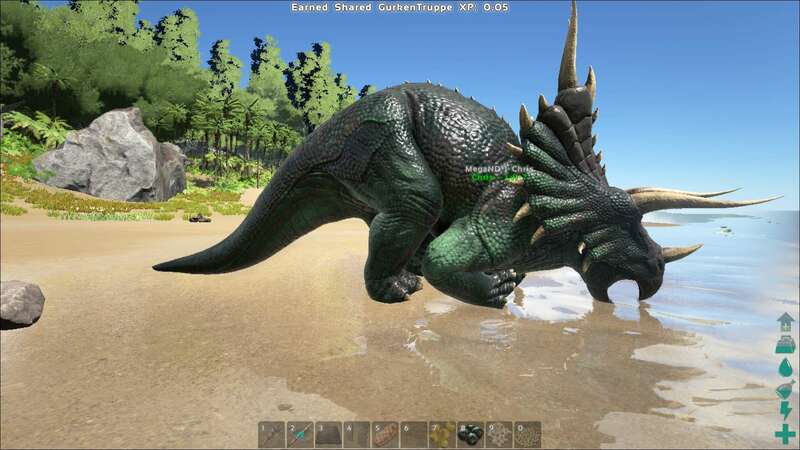 Before you can begin an adventure with your newly tamed friend, you will need to craft a Trike Saddle. This specific saddle can be unlocked at level 20 and requires 12 engram points to learn. Best start beating up those dodos; for this saddle you will need 140 hide, 80 fiber and 25 wood. Although slow and rather cumbersome, Trikes are a reliable and resilient mount with a decent base carrying capacity. Remember that Trikes can knock down any bothersome trees in your way, this makes travelling through woods bearable. Make sure to level up their speed, stamina and weight capacity. Trikes are decent battle mounts for starters. They pack a fairly good punch with their headbutt. Once you have mastered the knock-back tactic you will able to take on much stronger dinosaurs. For this build you should level up damage and health. 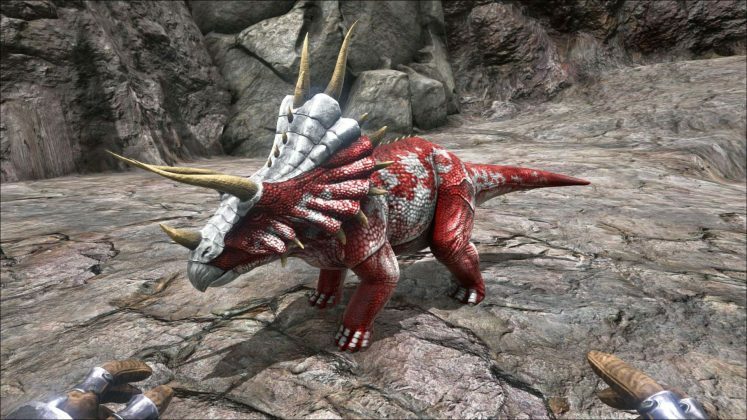 Triceratops are once of the best dinos for gathering berries. Put them to work harvesting for you. Level up melee damage. 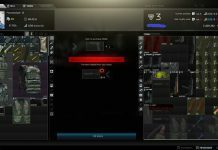 Looking for strong and successful early-game defence for your base? Why not tame a Trike. 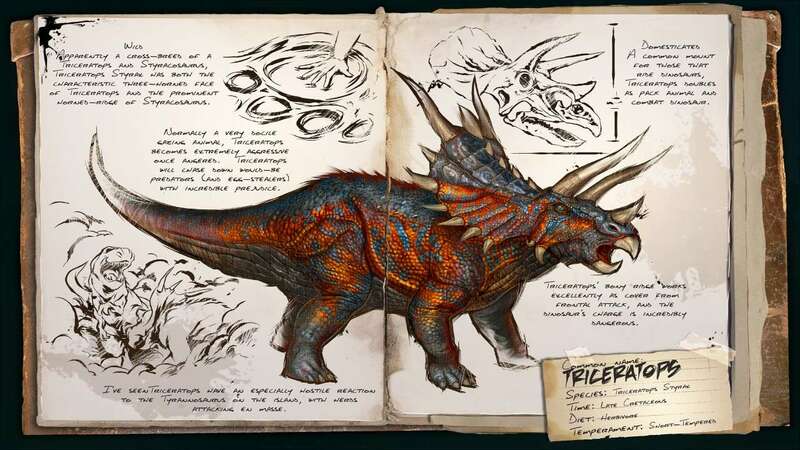 A trio of Triceratops will have no problem fighting off any hungry carnivores that come knocking. 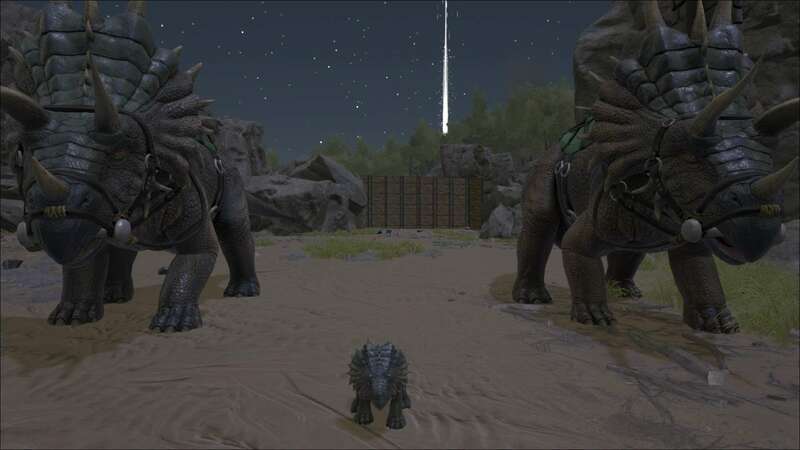 Breeding in Ark is never an easy process. But if you’re pining to see some tiny little Trikes running around then why not give it a try. Once you have managed to make your Triceratops mate, take the fertilised egg and begin the incubation period. Egg incubation is difficult at the best of times in this game, so trying to maintain the right temperature for prolonged periods of time is truly a challenge. It is recommended to have 2 air conditioners and multiple standing torches to ensure the correct incubation temperature is maintained. Temperature: 72-82 degrees F / 22-28 degrees C.
Maturation: 23 hours and 9 minutes. Triceratops family. Look at the baby! While riding the Trike you are able to use weapons. This is extremely handy when ambushed by predators. When dismounting, you will stand on the back of the Trike. If you crouch, you can use the large face plate as cover. You can actually shoot while standing on an attacking Trike, just try not to move or you may fall off. When you kill a wild Trike it will drop Raw Meat, Hide and Keratin. 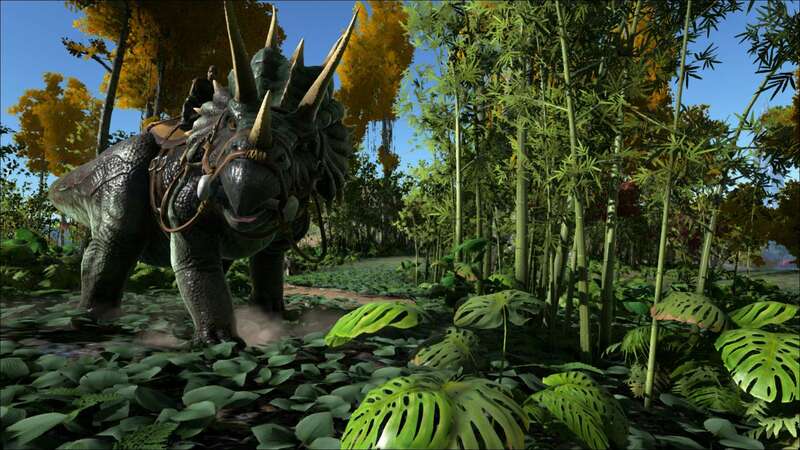 A tamed Triceratops can collect thatch, wood and an exceptional amount of berries. An avid gamer, story lover and writer. James has always enjoyed sitting down and procrastinating with a good game of League of Legends. In his free time, James enjoys swimming, tennis and sleep. 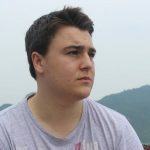 He aims to one day be a narrative designer for video games and wouldn't mind publishing a novel.